After toning down the initial hardware specs announced for this handset, ZTE plans to improve at least a few highlights and has set up a poll that allows those interested to choose what they want, so the Snapdragon 835 might be back in the game after all. Although it has some excellent handsets on the market, ZTE is not doing great overall these days, mainly due to the company's market share drop in its home market. However, ZTE Hawkeye promised to become one of the best crowdsourced handsets ever released back in the early days of its funding campaign. Unfortunately, most specs have been toned down in the meantime, and now ZTE tries to fix this problem. 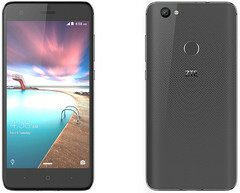 The first features and specs mentioned by ZTE included a generous battery offering around 4,000 mAh, a Qualcomm Snapdragon 835 processor, 4 GB RAM, HiFi audio, eye tracking capabilities, an adhesive back, and more. Sadly, the recently announced "final" list of specs and features only included a Snapdragon 625 chip, 3 GB RAM, 32 GB internal storage, a 3,000 mAh battery, and no mention of an advanced audio decoding solution. The remaining 30 percent go to users who have other suggestions. Some of those that ZTE should take into consideration include a 4 GB RAM and 64 GB storage setup, the use of a MediaTek Helio X30 or Helio X35 processor, Bluetooth 5.0, cameras with image stabilization, or the use of pure Android with eye-tracking features, without any skinning. It is also worth mentioning that those asking for rather high-end features are also willing to pay for them, so maybe ZTE should consider bumping up both the price and specs of this handset.